When there’s a significant temperature change in the outdoor air temperature, cracks can occur in glass. Specifically, particles of the glass expand when heated and contract when cooled. In extreme cases, when the degree and stress of this expansion/contraction process occurs, cracks happen. Most windows have their glass edges covered by a frame, right? Frames help shield some of the glass from heating sources, such as sunlight. Because of this, the glass that’s “framed” can be cooler (or warmer) than the rest of the pane. If the center of the window is doing one thing and the edges are doing another, in competition, thanks to extreme temperature changes, there’s a push and pull tension… which leads to cracking. Consider frames for a minute: timber/vinyl frames keep edges cooler. Aluminum/metal frames conduct heat. Meanwhile, the darker the frame, the more heat it will absorb. So, the type of frame for a window matters when it comes to thermal stress crack potential. Also, if the window is located close to a heating vent, it has a higher chance of cracking. Imagine– the window is freezing cold thanks to outdoor winter weather, but the indoor heating vent is warming it up on one side to the point where the particles in the glass have tension… and cracking occurs. Even where windows are located on a building play a role– are they under an overhang? Does a tree cast a shadow on them? Oh, and the size of the pane matters, too. The larger the pane, the harder it is to keep all the glass the same temperature. Can thermal stress cracks be prevented? Not really; they are a naturally-occurring phenomenon. 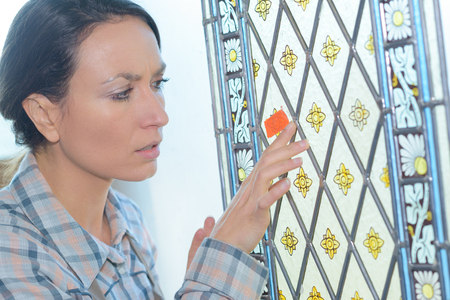 If you have stained glass windows that have cracked, don’t fret. Cumberland Stained Glass of Mechanicsburg, Pennsylvania, does stained glass window repair. With proper color matching and careful attention to detail, Cumberland’s experienced stained glass artists can fix chips, cracks and more. Please call Cumberland Stained Glass at 717-691-8290 for more information.